On Tchoupitoulas Street in the Central Business District, Revelator Coffee appears a fairly modest affair from the street, a narrow, whitewashed brick façade punctured by a blue-framed window/door combination. There are a pair of tables outside on the busy street, but you’re better off inside, where Revelator stretches out ahead of you, occupying a long, thin space, which is perhaps four times as deep as it is wide. There’s a large, open space between door and counter, which starts a little way back on the right. The till and cakes face the door, while the concise menu is on the wall to the right. Beyond this, there’s a small gap, then the counter continues, stretching all the way to a small, enclosed kitchen at the back of the store. The counter consists of a single concrete slab, topped by an overhanging wooden projection which provides space for 10 padded, plastic stools. The counter is an uncluttered affair, starting with a pair of Chemex, followed, after a long gap, by the two-group Slayer espresso machine and its solitary Compak grinder. Batch-brew, meanwhile, is against the wall behind the counter, and that’s about it. There’s more seating on the left, starting with a solitary two-person table opposite the front of the counter. Beyond that, Revelator opens out slightly, leaving space for six well-spaced two-person rectangular tables next to an unpadded wooden bench that runs along the wall, power outlets tucked away underneath. Right at the back, an opening in the middle of the wall leads to the toilets. The décor is as simple as the layout, with a wooden block floor, while the walls are exposed brick (front and right), the remainder a combination of whitewash/grey paint. High above you, the suspended ceiling is painted white, with multiple spotlights and strip lights to supplement the limited natural light at the front. Turning to the coffee, Revelator has four seasonal blends (Petunias, espresso; Lonely Hunter, filter; Pale Rider, decaf and Misfit, a darker roast which is retail only) plus typically five single-origins, all of which is for sale in store. Of the five single-origins, two of them are available on pour-over, the options changing every two weeks. I visited twice, on Sunday and then again for a quick visit on Thursday afternoon. During both visits, the espresso was a single-origin Peruvian Alegria which I had as a 4oz with milk. The barista offered me the choice between something macchiato-like or cortado-like, so I went with the cortado-like option. The coffee was fruity, with a touch of acidity, but it rather overwhelmed the milk, leaving me wondering if, on this rare occasion, a 6oz would have given a better balance. During my first visit, the Alegria was also available on pour-over and I was torn. I really wanted to try the espresso on its own, but also wanted to try the pour-over, so the manager took pity on me and made a pour-over for himself so that I could try some! The espresso was gorgeous, really fruity, but well-balanced, and only a hint of acidity. As a pour-over, it was very smooth, the fruitiness less immediately obvious, but coming to the fore as it cooled. I returned on the Thursday to try more of the pour-over, the coffee having changed over on Tuesday to a Rwandan Remera and a Sao Judas from Brazil. I ordered a Chemex of the Rwandan, while the manager split one of the Brazilian with me. Both were excellent, the Rwandan a smooth, well-rounded coffee, while the Brazilian had more classic, chocolate notes. Before I go, I must mention the cups, all in gorgeous stoneware, made in Louisville in Kentucky. Fortunately, Revelator doesn’t sell them, otherwise I might have bought far too many of them! 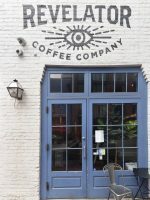 This entry was posted in Cafe/Roaster, Cake, Coffee Shops, Laptop Friendly, New Orleans, Retailers and tagged include, Revelator, USA2019-04 by Brian Williams. Bookmark the permalink.